Our Dit Da Jow Herb Mixture is based on a traditional martial art formula for treating external injuries and made exclusively by East Earth Trade Winds. This mixture provides you with a complete premixed formula to make your own Dit Da Jow. To make your own authentic Dit Da Jow (铁打酒) you'll need one gallon of high proof alcohol or vodka (you must purchase alcohol yourself). Then add the herbs to the alcohol and soak for a minimum of three months (but the longer you soak them the better). We suggest starting difference batches so you always have some to use. After it is ready, use it topically for any external injury, bruise, sprain, strain, or Iron Palm training. Use of this formula will speed up the healing process and reduce injury recovery time. East Earth Trade Winds uses the highest quality herbs are used in this formula. It contains: Gummi Olibanum Myrrh, Angelica Pubescens, Sanguis Draconis, Ligustici Wallichi, Carthami, Persicae, Angelica Sinensis, Pollen Typhae, Psuedoginseng. Gummi Olibanum (Chinese: Ru Xiang) is a sap that comes from the Boswellia tree. It is commonly known as Frankincense or Mastic. This herb belongs to the category of Herbs that Circulate Blood. It is said to invigorate the blood, promote the movement of Qi, stop pain, and promote the healing and regeneration of damaged tissue. It is often used for traumatic pain due to blood stasis (e.g., bruising). Gummi Olibanum can also relax the tendons and reduce swelling. Myrrh (Chinese: Mo Yao) is a fragrant gum resin that also belongs to the belongs to the category of Herbs that Circulate the Blood. It in said to break up blood stagnation to stop pain, reduce swelling, and generate flesh. It promotes healing. When used in conjunction with Olibanum both the Qi and Blood are addressed. Our East Earth Trade Winds Herbalist says that while Olibanum invigorates the blood, Myrrh disperses blood. Myrrh is said to be better for stagnation. Both of these herbs can stop pain, reduce swelling and promote regeneration of damaged tissue. For this reason the two herbs are often used together. Angelica Pubescens (Chinese: Du Huo) is categorized as an Herb that Dispels Wind-Dampness. These herbs alleviate pain in the muscles, ligaments, tendons, joints and bones. Angelica pubescens expels cold and promotes Qi and Blood flow. It disperses cold and unblocks painful obstruction (bruises, swelling, etc). It can be used for chronic and acute problems. Sanguis Draconis (Chinese: Xue Jie; English: Dragon's Blood) is a resinous secretion of the fruit of Daemonorops draco. It gets its name because of its resemblance to dried blood. It belongs to the category of Herbs that Circulate the Blood. It dispels blood stasis and alleviates pain and is used for symptoms related to injury from falls, fractures, bruises, and sprains. It is used with Olibanum and Myrrh for bruising, swelling, and pain from trauma. It can stop bleeding when applied topically to an external injury. It invigorates the blood, disperse stasis, and stops pain. Our East Earth Trade Winds Herbalist says that Sanguis Draconis is often combined with Olibanum and Myrrh. All three of these herbs have similar functions but Sanguis Draconis is most able to promote the regeneration of tissue, help sores heal, and stop bleeding. This herb is one of the most expensive substance found in this formula. Ligustici Wallichi (Chinese: Chuan Xiong) belongs to the category of Herbs that Circulate the Blood. It warms and unblocks the blood vessels invigorating the blood, promoting the movement of qi, expelling wind, and stopping pain. It can be used for any blood stagnation pattern. It is often combined with Angelica Sinensis for pain and numbness from stagnant Qi blocking the Blood channels. 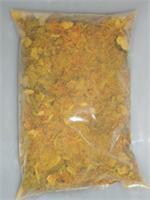 Carthami (Chinese: Hong Hua) commonly known as Safflower belongs to the category of Herbs that Circulate the Blood. It invigorates the blood, dispels stasis, and stops pain. Because it is light in weight it is said to have a rapid effect on the movement of blood and the transformation of stasis and stopping pain. Persicae (Chinese: Tao Ren) belongs to the category of Herbs that Invigorate the Blood. It invigorates the Blood and is an important herb for dispelling stasis due to traumatic injury. It is used with Angelica sinensis for pain due to trauma. It is also used with Carthami for invigorating the blood as both herbs promote the flow of blood and dispel stagnation. Angelica Sinensis (Chinese: Dang Gui) is a commonly used herb in Chinese medicine. It's main purpose is to tonify the blood. But it also invigorates and harmonizes the blood and disperses cold. It is an important herb for stopping pain due to blood stasis. It is commonly used for traumatic injury. It is combined with Olibanum and Myrrh for strains and fractures. Pollen Typhae (Chinese: Pu Huang) belongs to the subcategory of Herbs that Stop Bleeding. Pollen Typhae is the yellow colored pollen from cattail or bulrush. It is known to stop bleeding and is used for external bleeding associated with traumatic injury. It also invigorates the blood and dispels blood stasis. Using this herb can relieve pain from blood stagnation. Psuedoginseng (Chinese: San qi or Tian Qi) belongs to the category of Herbs that Stop Bleeding. This herb stops bleeding without causing blood stagnation, transforms blood stagnation, reduces swelling and stops pain. Because it reduces swelling and alleviates pain this is the herb of choice for traumatic injuries and is used for swelling and pain due to falls, fractures, contusions, and sprains. According to our East Earth Trade Winds Herbalist in Chinese medicine Blood stagnation causes pain and when the stagnation is removed then the blood can resume its normal circulation which helps eliminate pain and swelling. Caution: For External Use Only. Do not apply to broken skin.